The inn is a 5-min. walk from Echigo Yuzawa Station. 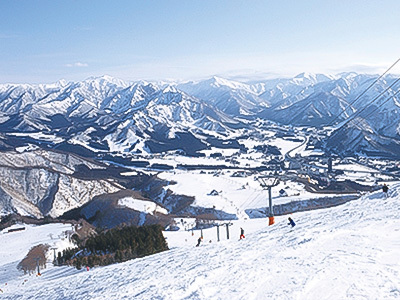 Consider enjoying a stay at a Japanese inn while on a skiing or celebratory trip. 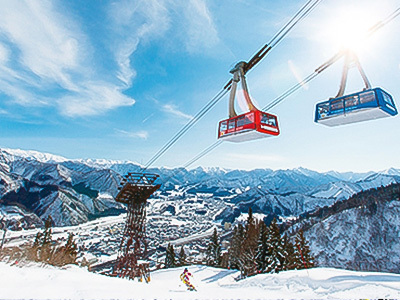 Winter is the time for ski resorts. In a small town of just over 8,000 people, there are a total of 12 ski slopes. 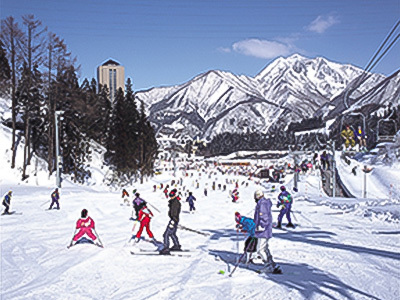 The Ippon-Sugi Ski Area where beginners and children can easily enjoy the snow is a short 2-min. walk from the inn. And, there is nothing to worry about after you finish skiing as the Inn is equipped with a Clothes Drying Room and you can still use the baths even after checking out. 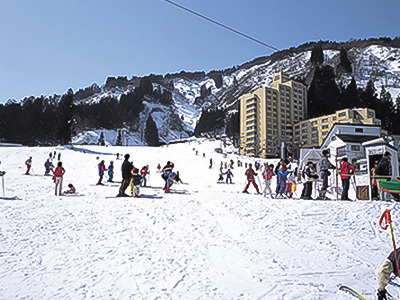 Located in the center of Echigo Yuzawa Hot Springs, this is a family-friendly ski area situated on level ground. Everyone from children to seniors can enjoy skiing and then refresh themselves with delicious rice. This is a world of silver spread out everywhere over a plateau at an altitude of 1,000m. It also has a Kids’ Park where children can sleigh on the snow, slide down it on a tube, engage in snowball fights, and do many other fun things playing in the snow. Here beginners to advanced skiers can enjoy skiing and snowboarding to their heart’s content. It is a slope extremely easy to access and you can arrive at “GALA Yuzawa Station on the JR Echigo Shinkansen from Tokyo Station in 77 minutes without having to bring any equipment with you. These are slopes dedicated to skiing and are extremely popular with families! Complete with mogul, powder snow, and parks, they can accommodate all types of skiing preferences. There are a total of 13 courses which even beginners can enjoy. 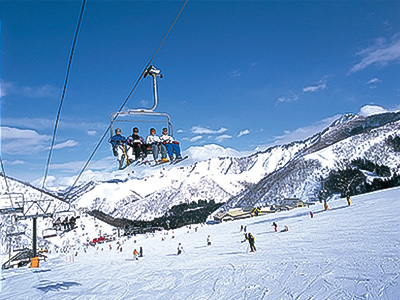 It also offers “Kids’ Park” to enable the entire family to enjoy skiing. It features several courses for beginners and medium-level skiers, so you can ski together with you family and friends. 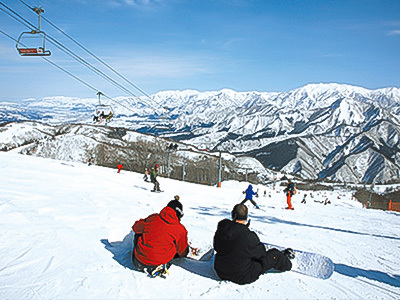 It also has a ski slope which will satisfy high-level skiers. 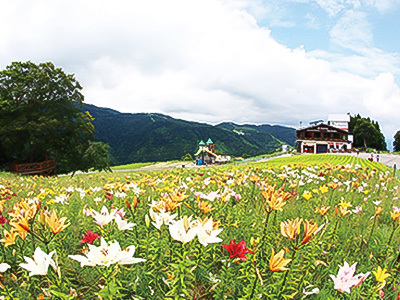 Blessed with abundant nature, at Echigo Yuzawa there are many wonderful things to enjoy in each season - winter, spring, summer, or fall. 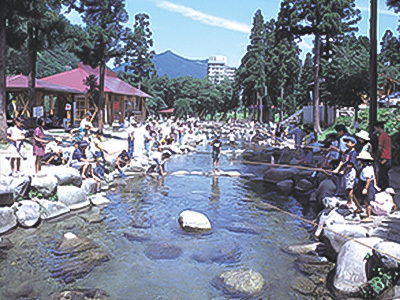 Visit one of Japan’s few regions with such picturesque scenery which includes the changing colors in autumn and Yuzawa Kogen Ropeway, and participate in river fun in the summer. 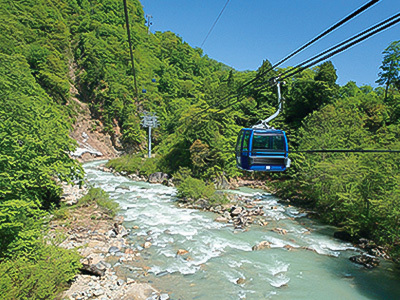 This is Japan’s longest gondola stretching 5,481m. It links Naeba to Tashiro in about 25 minutes. 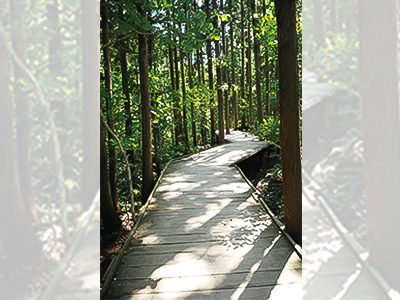 At 1.7km and 2m wide, this is Japan’s longest wooden promenade where children and the disabled in wheelchairs can stroll in the natural environment. By purchasing a wooden plank for 1,000 yen and then writing a message, you can participate in building the boardwalk. 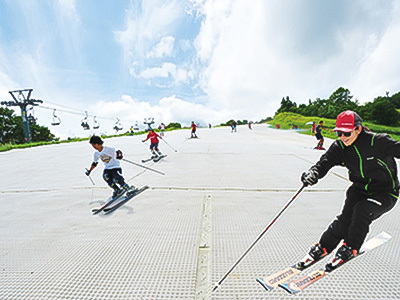 After boarding a gondola and traveling through the skies, you can enjoy using the artificial ski slope in the field in the center of the mountain and enjoy skiing and snowboarding even in summer. The area is filled with fun activities, including summer bobsledding on a 706m run, go-carting enveloped in the refreshing air of the plateau, and the comfortable but exciting Zipline Adventure. 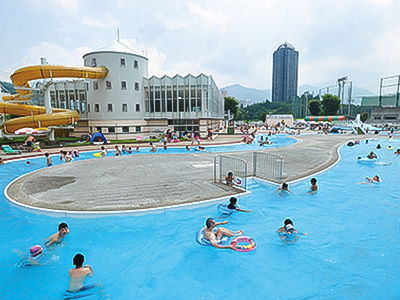 Leisurely swim in either an indoor or an outdoor swimming pool designed like meandering rivers, and if you fancy a thrill, slip down the waterslide. You can enjoy with your entire family. 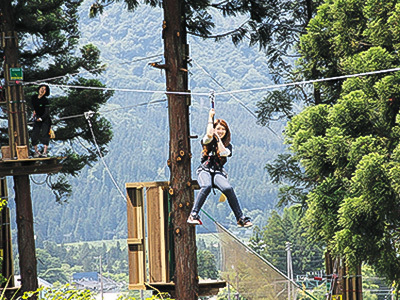 Forest Adventure Nakazato is an adventure park based on the concept of co-existing with nature where you can use naturally standing trees to move from one tree to another high in the sky. Enjoy a new experience in the middle of a forest. 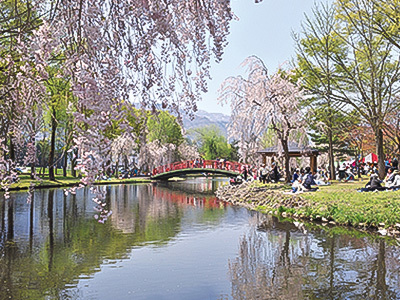 Approximately 10 minutes from Yuzawa IC, this is a fishing park where you can enjoy catching char, Yamame trout, rainbow trout, and other fish. You can charcoal grill the fish you catch right where you are. You can even catch as many as you like and barbeque them. A park where you can play sports care freely on an expansive ground. In addition to playing tennis on one of the 24 individual tennis courts, you can also enjoy soccer, baseball, and a variety of other sports.